Should You Avoid Everest Re Group Ltd (RE)? Investing in small cap stocks has historically been a way to outperform the market, as small cap companies typically grow faster on average than the blue chips. That outperformance comes with a price, however, as there are occasional periods of higher volatility and underperformance. The time period between the end of June 2015 and the end of June 2016 was one of those periods, as the Russell 2000 ETF (IWM) has underperformed the larger S&P 500 ETF (SPY) by more than 10 percentage points. Given that the funds we track tend to have a disproportionate amount of their portfolios in smaller cap stocks, they have been underperforming the large-cap indices. However, things have dramatically changed over the last 5 months. Small-cap stocks reversed their misfortune and beat the large cap indices by almost 11 percentage points since the end of June. In this article, we use our extensive database of hedge fund holdings to find out what the smart money thinks of Everest Re Group Ltd (NYSE:RE). Everest Re Group Ltd (NYSE:RE) was in 18 hedge funds’ portfolios at the end of the third quarter of 2016. RE has seen a decrease in enthusiasm from smart money lately. There were 22 hedge funds in our database with RE holdings at the end of the previous quarter. 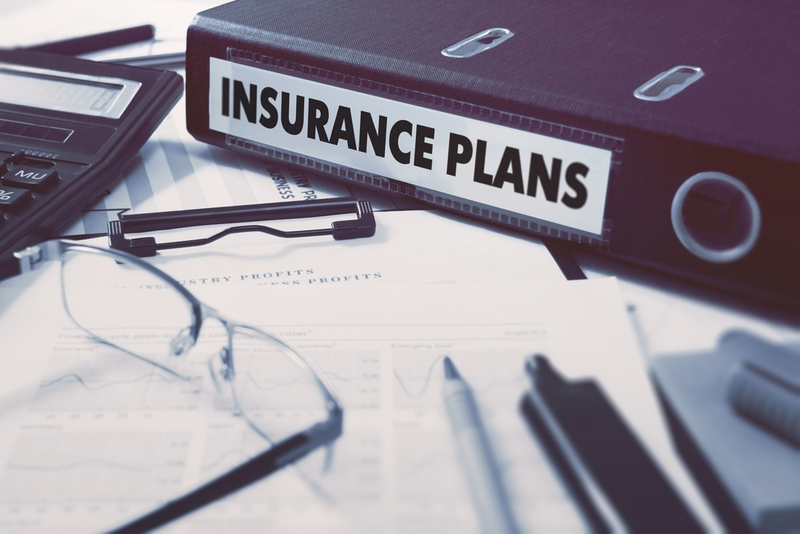 At the end of this article we will also compare RE to other stocks including Teleflex Incorporated (NYSE:TFX), A. O. Smith Corporation (NYSE:AOS), and Broadridge Financial Solutions, Inc. (NYSE:BR) to get a better sense of its popularity. What have hedge funds been doing with Everest Re Group Ltd (NYSE:RE)? At the end of the third quarter, a total of 18 of the hedge funds tracked by Insider Monkey were bullish on this stock, an 18% decline from the second quarter of 2016. 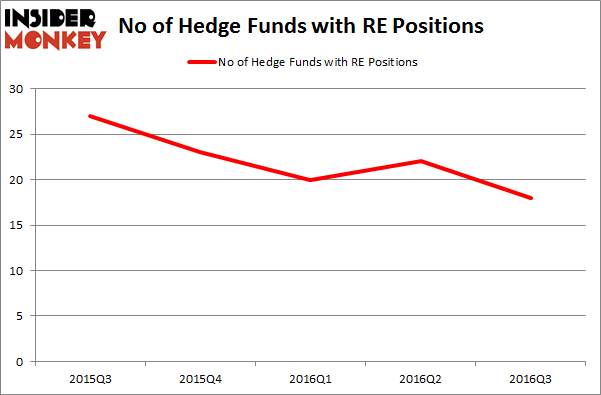 The graph below displays the number of hedge funds with bullish position in RE over the last 5 quarters. With hedge funds’ sentiment swirling, there exists an “upper tier” of notable hedge fund managers who were increasing their stakes considerably (or already accumulated large positions). According to Insider Monkey’s hedge fund database, Mason Hawkins’ Southeastern Asset Management has the most valuable position in Everest Re Group Ltd (NYSE:RE), worth close to $212.7 million, amounting to 2% of its total 13F portfolio. The second most bullish fund manager is Cliff Asness of AQR Capital Management, with a $176.2 million position. Other peers that hold long positions consist of Ken Griffin’s Citadel Investment Group, Jim Simons’ Renaissance Technologies and David Harding’s Winton Capital Management. We should note that Southeastern Asset Management is among our list of the 100 best performing hedge funds which is based on the performance of their 13F long positions in non-microcap stocks. Biotech Movers: Heat Biologics Inc (HTBX) And Achaogen Inc (AKAO) Should You Buy BJ’s Restaurants, Inc. (BJRI)? Has Hedge Fund Ownership in Welltower Inc. (HCN) Finally Bottomed Out? Infosys Ltd ADR (INFY): Are Hedge Funds Right About This Stock? How Big Lots, Inc. (BIG) Stacks Up To Its Peers Is WebMD Health Corp. (WBMD) A Good Stock To Buy?